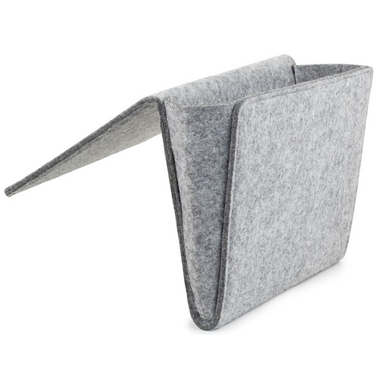 The Kikkerland Felt Bedside Caddy is a soft and secure pocket that's the perfect place to keep all your bedside essentials safe. Fits all couches and beds. Dimensions: L 13.19" X W 1.38" X H 9.84"
This is perfect! It works the way I had hoped and the way all of the reviews said it would. It's a firm pocket where I keep my evening meds (boring but necessary), tissues, paperback books and other oddities. Large enough for the necessities but not too big for items to get lost. I'm going to purchase another for my guest bedroom because it's super handy! Perfect!!! Well made, love the color blends nicely with decor, gives extra storage without being obstructive. We have two one for each side of our Kingsize bed. Hubby loves it too!!! 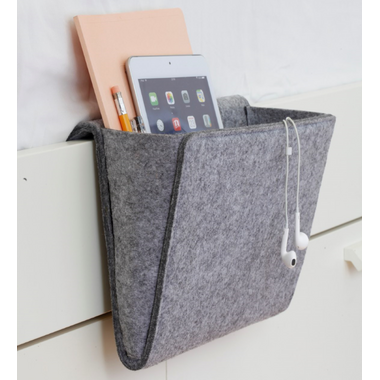 Perfect for my iPad and cords. It is well-made and the soft material is lovely. This thing is so handy! I originally bought it as a gift for my boyfriend but he loves it so much I had to get one for myself! When I first saw this I thought it was kind of random, but it is SO useful! It fits ALOT of things: glasses case, water bottle, eye mask, you name it. It's much easier than a bedside table. I bought one for my spouse who uses his beloved old iPad 2 to read in bed but had nowhere to put it because we don't have room for side tables. He loved it so much that I got one for my dad for Father's Day, who reports that he loves it too. I was surprised by how high quality the felt was-- it's not in the least bit flimsy. Good looking, modern and convenient. I bought two! I have mine on the side rail of my sleigh bed. It's curved but it still fits. I keep the T.V. remotes and my ereader in it. Great. What a great quality product and fits almost everywhere. I have mine at the end of the sofa to hide all the necessary items you need for the TV and other things that would otherwise lay on the coffe table. Very convenient. I use it to store all our chargers in, by the bed. Didn't fit perfectly into the frame because we have a metal frame underneath our mattress, so it went in about 30% of the way, but we still use it and love it! This product is so easy to slot in between the bed and mattress or under your couch cushion. It fits everything you need and it looks so stylish! Intention is to give this as a gift. Seems to be of good quality and durability. By inserting under the mattress or couch cushion, a person can keep their essentials close by. Slots in great between the mattress and frame, super handy for throwing in all the essential tech hanging around the bed area i.e. iPad, eBook reader, phone, tv remote, etc. Convenient and surprisingly spacious, love this caddy.